The West Shore Gig will meet on Monday, August 13 at 8:00 a.m. at the Community Center of the Camp Hill Giant. 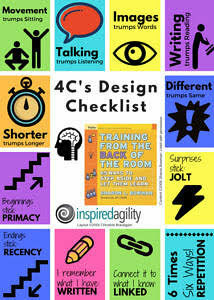 Participants will explore the 4C's instructional design and delivery model introduced by Sharon Bowman in her book, "Training from the Back of the Room!" Join us to learn about this straightforward, easy instructional design process that builds interactivity and high-impact customization into every learning event!